Got two wonderful cd’s in the mail this week from the Jerry Garcia Store. 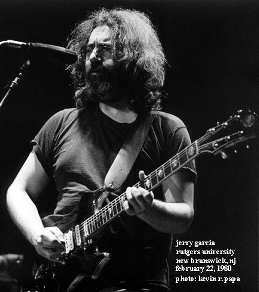 After Midnight, recorded in 1980 and Jerry Garcia & Merl Saunders Band: Keystone Berkeley, September 1, 1974. Haven’t listened to them both in full length, but I picked some favorite tunes. Already had some Merl and Jerry on DAT tape, but this cd set sounds amazing. Especially considering this stuff is now over 30 years old. And this set even comes with a cool Keystone Napkin ! Robert Hunter writes in the liner notes of the JGB’s After Midnight that Jerry Garcia is probably the Top Dylan Interpreter. And I most certainly agree. Just listen to Going Going Gone with the haunting organ of Merl Saunders and I don’t think anyone can disagree. For some reason Jerry’s voice match the Dylan songs perfectly. After Midnight has a wonderfull Simple Twist Of Fate and Heaven’s door. Just realised it’ll be ten years ago in august, Jerry died. Now that’s sad :(. Posted in Music on 27/1/2005 by Eric. 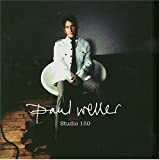 This new album by Paul Weller is named after the studio it was recorded in. In this interview over at the Rolling Stone site he explains he always wanted to do an album filled with covers, and this is it. It turned out pretty good, some songs stay closer to the originals than others. For example Close to me (of Carpenters fame) is very different from the original, where Wishing on a star is more close to the original, though somewhat more modern. Some songs stand out for me though, like Black Is The Color, which is a tradional according to this site, very touching, especially when you’re in an emotional mood ;). Neil Young’s birds, which is pretty much the same as the original, added some nice background vocals, suits Weller’s vocals really well. Always liked Gordon Lightfoot’s Early Morning Rain, especially Elvis rendition and even Dylan’s version on Self Portrait (yeah I know, sue me), but this one is done with a lotta love for the song, sung from the heart. Actually that goes for all the songs on this album. Speaking of Dylan, All Allong The Watchtower is excellent as well, a refreshing arrangement. This album is definately a keeper ! Posted in Music on 25/1/2005 by Eric. This week I watched this movie, and thought it was very nice. 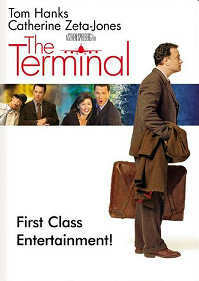 It’s about an immigrant who gets stranded at JFK, because there is a civil war going on in his home country and he can’t get a new valid passport. Just like in Forrest Gump, Tom Hanks plays a very easy to like character. From the first scenes on, you love the guy and you only wish him the best ;). Though he acts a little ‘too stupid’ at first, but I guess we just have to assume that’s because he doesn’t understand the language, and has no clue what is going on. Needless to say Catherina Zeta Jones looks lovely and the support cast is really good too, like Chi McBride (Boston Public). Like all ‘feel good’ movies this one ends happily though with a twist. It even gets a 7.0 at IMDB. Go and rent/ buy it if you can. Posted in Movies / TV on 23/1/2005 by Eric. Ever since I got a U2 special edition Ipod in december, I have been checking out various podcasts and was seriously questioning what all the hoopla was about. I do like the slashdot podcast, but it’s not much different than browsing the slashdot site. The Reel Review podcast really adds to the site’s content. It’s like a really good radio show, though with one big difference, YOU decide when you want to listen to it. It features reviews of classic (and not so classic) movies. So in case you’re interested in that kinda thing make sure to check it. The new edition has a review on Wim Wender’s Paris Texas, which made me want to order the DVD right away ;). Shows you how much love for movies goes into this podcast. Really looking forward to the Apocalypse Now cinephile series. Posted in Internet, Movies / TV on 12/1/2005 by Eric. When I noticed that this movie was available, being a big Johnny Depp fan, I had to get it right away. Already read some good reviews and it’s rated a whopping 8.3 at IMDB ! And I must say, even though the expectations were high it certainly didn’t disappoint me. Depp does a very fine acting job, even uses a mild, though believable scottish accent. Kate Winslet is fine as well, and even Dustin Hoffman has a small part. 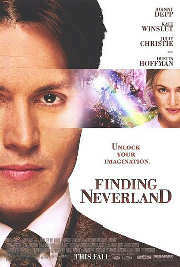 The movie is about the author of Peter Pan, around the time he wrote that play. His previous play had flopped and his marriage was going bad. Then he met the widow (Winslet) in the park with her children. They become closer and closer, and being a big kid himself (I am sure just about every man has heard that at least once in his life) he gets along very well with the children. I won’t tell you the rest, just watch it for yourself, but it’s not all happy (luckily). The 25 empty seats was a very nice touch, it certainly surprised me :). Go and see it when you can. One of the best ones of 2004. And it’ll definately be one of the best DVD releases of 2005. Here is a fine review of this movie. Posted in Movies / TV on 9/1/2005 by Eric. Yesterday I received a package from Amazon.com, it contained the Johnny Cash 5 cd set (+ wonderful booklet) Unearthed and a book on Cash called The Man Comes Around: The Spiritual Journey of Johnny Cash. Have listened to 2 of the 5 discs and read the last few chapters of the book. Am definately planning on reading the whole thing though, really like the writing style of the few chapters I read so far. The cd’s are wonderful ! I can’t believe the 2 Neil Young song (Pocahontas and Heart of Gold) never made it onto any of the American Recordings discs. There is definately a contrast between the stuff he recorded before June, his wife died and stuff he did there after. Didn’t know it was possible, but his voice sounds even darker. You definately don’t have to be a Country fan to enjoy this stuff. 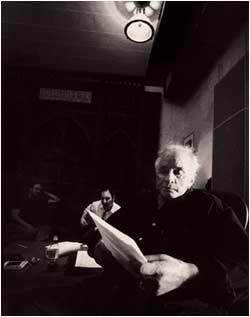 Just check out any of the 4 american recordings discs, I am sure you won’t be able to put it down once you listen to them. After reading and listening to him last night I decided to put a nice photo of him, I had no room for here at home, in the office at work. He’s now sitting right next Marlon Brando and Jerry Garcia behind my PC :). There is a good article here on CNN that tells his story quite well. It’s the obituary they posted after his death in ’03. Posted in Music on 7/1/2005 by Eric. 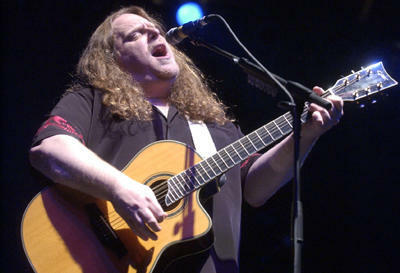 Great times for fans of guitarist / singer Warren Haynes ! Over at the bit torrent site of etree.org, there are now several shows up for grabs. A few different sources captured the New Years show Gov’t Mule did. Am listening to that one right now, and it’s spectacular. Very fat guitar sound and excellent bass. Have never listened much to this band, but I certainly will now. Also over at the etree site is the Xmas jam he organised on dec. 18th. This jam is a great opportunity to get to hear some lesser known acts and bands and WH’s acoustic sets are always a pleasure to hear. I just ordered his Live At Bonnaroo CD. His version of U2’s One is worth the price alone. Also a lot of other jam bands and Dead (related) material at Etree.org. Make sure to check it out in case you’re interested. And when you’re new to all this stuff (flac torrent etc), read the tutorials and faqs on the site. They’re very helpful. UPDATE:Warren’s Jam from 2-2-2005 can now be downloaded using bit torrent from bt.etree.org. Posted in Internet, Music on 4/1/2005 by Eric. 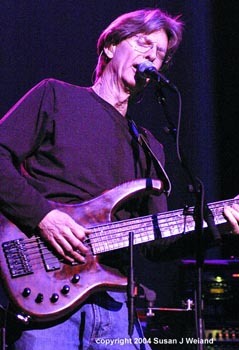 Phil Lesh has decided to release digital soundboard recordings of the show, he and his friends did on dec. 17th,18th and 19th 2004 ! I just noticed when I checked alt.binaries.gdead usenet group. I am very much looking forward to listening to these shows. Already got the 19th audience recording that opens with a wonderful Box Of Rain. Will probably mp3 them to put them on my iPod and listen to them before I fall asleep at night ;). For more info on the setlists and Phil’s future endeavours, check out The Philzone. Posted in Music on 3/1/2005 by Eric.